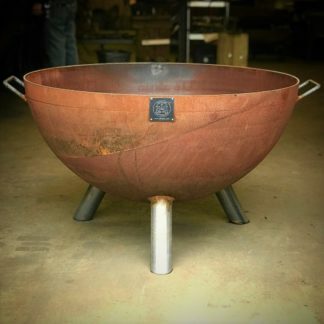 A fire pit is a simple accessory that will enhance your home’s outdoor living space. In addition to cooking over an open flame, it creates a relaxing ambiance that you and your guests are sure to enjoy. But if you’re planning to use your fire pit on a wooden deck, there are a few things you should know. Keep reading for a complete list of do’s and don’t when using a fire pit on a wooden deck. It’s a good idea to clean your deck before lighting your fire pit. Depending on your proximity to nearby trees, pine straw, leaves and other debris may accumulate on your deck. Assuming they are dry, these things can easily spark an unwanted fire. A stray ember may land on nearby debris, setting it ablaze. So, using either a push broom or leaf blower, clean your deck before lighting your fire pit. You have to remember, though, that fire pits put out a lot of heat — and too much heat can damage your home’s siding or even set it ablaze. So, remember to keep your fire pit at least 20 feet away from your home and all other structures. You should also dispose of your fire pit’s ashes after it has cooled. Allowing the ashes to sit inside your fire pit for days (or longer) is never a good idea. Some of the ashes may blow out and onto your deck, or they may soak up moisture and contribute to corrosion. Either way, these problems are easily prevented by waiting at least 24 hours and then shoveling the ashes into a metal bucket or similar metal container. Alternatively, you can save your fire pit ashes to use as garden compost, insect repellent or other purposes. 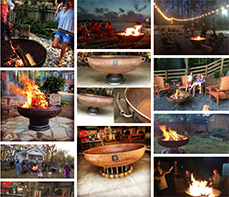 For a list of 10 everyday uses for fire pit ash, check out our previous blog post here. Avoid placing your fire pit directly on your deck or other wooden surfaces. 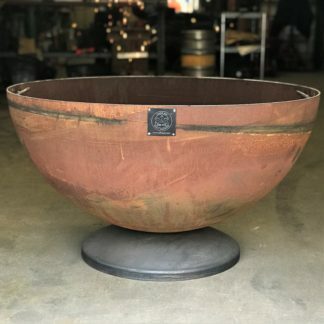 While heat rises — meaning most of the heat created by your fire pit will be projected upwards — the bottom may still contain enough heat to singe or otherwise burn your deck. You can protect your wooden deck from such damage, however, by placing something between it and your fire pit. A small grid of pavers should do the job. Simply arrange the pavers to cover the area of the deck where you’d like to use it, after which you can place the fire pit on top. 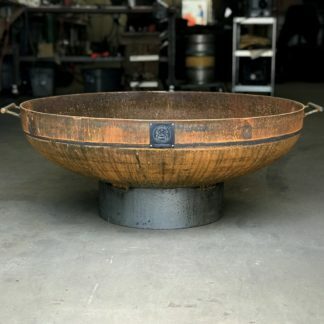 Another idea is to use a special heat-resistant fire pit mat, which as the name suggests is designed to withstand the 450+ degree temperature of a fire pit. Either way, you need something underneath your fire pit to protect your wooden deck from damage. It’s always better to be over-prepared than underprepared. While it’s doubtful you’ll ever need, you should keep water near your fire pit in case the fire spreads outside of the pit. A pitcher, large bucket or even a garden hose will all suffice for this purpose. In the unlikely event that you see a secondary fire, you should douse it with water ASAP. There’s really no point in using lighter fluid in a fire pit. Assuming you use dry, seasoned wood, it should ignite with little effort. You can add some tinder and kindling to the middle to help get it going. Simply position your wood so it’s propped up with the center empty and allowing for air to pass through. Lighting some tinder and kindling in the middle will then get your fire going. Adding lighter fluid isn’t recommended, as it increases the risk of injury and property damage. You might be surprised to learn that some cities and municipalities have laws regarding the use of fire pits and other open flames. Some, for instance, only allow then on decks when they are at least 20 feet away from your home. So, before using your fire pit on a wooden deck, check to see what (if any) ordinances are in place for your area. Finally, never leave your fire pit burning attended. If you need to run to the store, ask a family member or friend to watch it. This rule isn’t limited strictly to fire pits; it applies to all fires. An unattended fire could spark a secondary fire, and without something there to douse it with water, it could cause significant property damage or bodily injury. These are just a few do’s and don’ts to follow when using a fire pit on a wooden deck. Hours: M-F 9-5 – Out for Lunch 12-1:15. Weekends by appointment, please call.